The challenge of developing an app for the legal market is to define a compelling reason for lawyers to use it. We are all busy and we all have established sources for getting the news and information we need. A new app introduced last week is an example of one that is nice enough in concept and well executed in design. But it falls short in delivery and offers no strong reason for me to use it. For a free app, Legal Newsance has lofty goals, promising to deliver curated legal news across a range of topics, legal research, job listings and on-demand CLE. The problem it has, at least at this point in its development, is that each of these categories are fairly sparse and scattered in the content they provide. For example, the description of the legal research component on the Legal Newsance website lures you in with the come-on, “Tired of paying expensive subscription fees to access online research resources?” Well, maybe you are, but this app does not provide a substitute to paid research resources. Rather, it consists primarily of links to readily available government sites containing statutes, regulations, court rules and the like. To its credit, it does a nice job of organizing this information and making it easy to find. Research links are organized by main practice-area topics such as “Advertising and Media,” “Corporate and Securities,” and the like, each of which drills down to further subtopics. Job listings and on-demand CLE programs are similarly sparse. Job listings so far appear to come from just a handful of large law firms. In fact, the bulk of the listings appear to come from just three firms. The CLE listings come primarily from the Colorado Bar and Continuing Education of the Bar in California. The app does not actually deliver these programs; rather it lists them and provides links to their registration pages, where you can purchase streaming versions. In fact, if you want to see which programs are listed in the app, you can see the same listings on the Legal Newsance website. 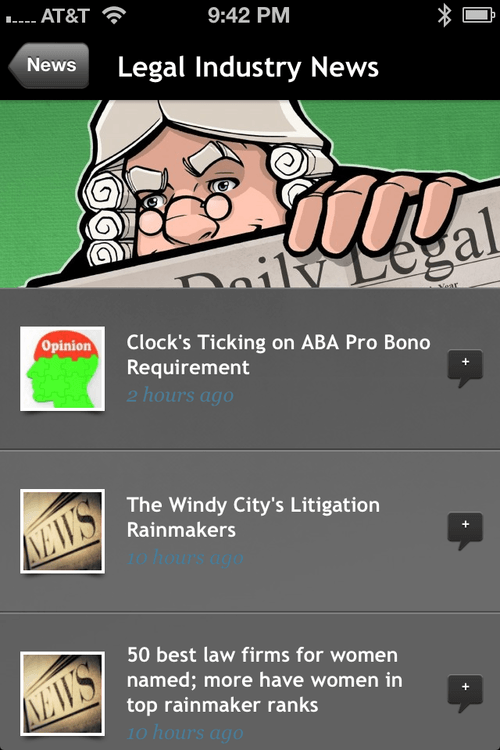 Possibly the most fully realized component of the app is its legal news feed. As with the research section, the news stories are organized by practice-area topics. There are also sections for top stories, legal industry news, “legally insane,” and work/life stories. Here again, however, the selection of stories lacks sufficient focus to compel me to use this on a regular basis. Perhaps if I was killing time somewhere, I might browse its headlines. But generally I get my news feeds from sources I have already selected and set up. And my regular sources already include some for general legal news from around the country, such as the ABA Journal’s Law News Now. Let me stop right here and give the app’s developers credit where credit is deserved: They have adopted an explicit policy of not “scraping” legal news and blog posts. They spell it out right on their website and I applaud them for that. When you click on a headline within the app, you go to a page that provides a brief excerpt of the story, that identifies the source of the story, and that provides a link to the full text at the source site. Given that the app is free, the question arises of how its developers make money. 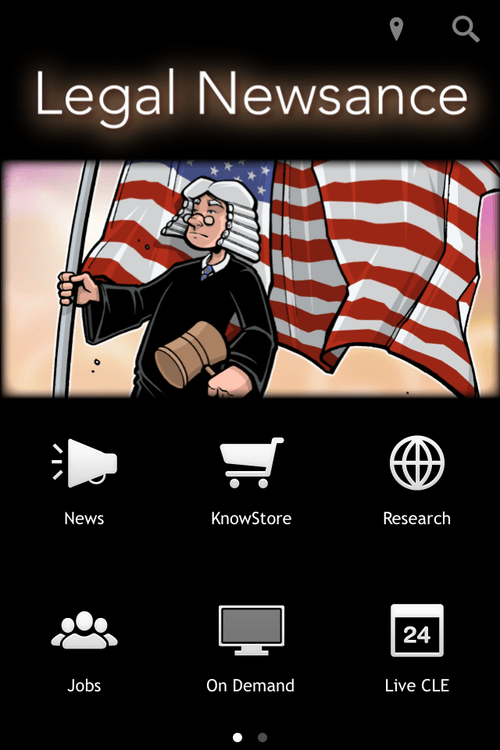 The answer is through a component called the KnowStore, which also exists on the app’s website. The KnowStore sells what it describes as “focused, targeted legal know-how.” By another name, these products are legal forms — so far all contract and corporate templates and clauses. You can purchase these through the app at prices that range from 99 cents to $2.99. The app is available for iPhone, iPad and Android devices. I tested it on my iPhone, where it was responsive and easy to use. It would not work on my Nook HD+, possibly due to the Nook’s bastardized Android OS. The Colorado company that developed it, Similan Labs LLC, was formed by an attorney who was formerly head of legal for a New York IT services and software development company. You may find this more useful than I did. But as I said at the outset, I look for apps that give me a compelling reason to use them — that serve some useful role in my daily work or that fill a gap in my information needs. This one does not does not do that for me.